Cheap running shoes have both an advantage and a disadvantage. When you say “cheap,” two implications come to mind. First, cheap shoes are affordable shoes. These are shoes that you can easily afford, but they still offer excellent quality and performance that one can expect in a shoe. Second, discount running shoes are shoes that may be sold affordably because they are not built at top quality. Below you can find some of the best choices out there. All runners who have tried shopping for running shoes at one point in their career knows just how financially taxing a running shoe investment can be. This is definitely a huge financial burden. Fortunately, if you don’t mind the extra effort, you can find some good but cheap running shoes out there. There are some shops that even offer you 50% discounts on running shoes. You just have to make some effort finding these shops instead of running straight to the local athletic shop in your area. If you want to save money on running shoes, the key is research. You have to know exactly what kind of shoes would be best for you given your foot type. This is crucial because an affordable pair of running shoes is not affordable if you don’t get to use it. So to make sure you get to use the product you invest on, you have to choose the right shoe that your feet needs. Having said that, if you choose to go with either Nike or Asics running shoes in your quest you won't be disappointed. They have incredible duration and you'll find Nike and Asics discounts sales on most top running shoes store. Pay especially attention to Nike Air Pegasus, Nike Lunar Trainer (and Elite) as well as the two Asics Shoes : Asics Gel Nimbus and Asics Gel Kayano. You can't go wrong with these ! Having said that , the right shoe should fit your foot and your stride. To figure this out, find out whether you are an overpronator, an underpronator, or a neutral runner. For overpronators, the best shoes are motion control shoes. For mild overpronators, the best shoes are stability shoes. For underpronators, the best shoes are the cushioning shoes. Lastly, there are neutral shoes that are designed for the common neutral type of foot. If you want a more close look at the different choices within each of these categories, take a look at an overview here : in the best running shoes section. If you know what kind of shoe you need, this helpfully narrows down your choices, so you can start comparing the ones that fit your requirements so far. If you already have a list of running shoes that fits your foot requirements, you can move on to the next step in the search process, which is to compare the different options you have. The same shoe models are sometimes sold at different prices depending on where you buy. Price range also differs based on the brands. Comparison shopping can help you find the top offers in the market, and this can save you a lot of money if you just take the time and effort to compare different options. And of course, don’t forget to keep your eyes open for promos and discounts. Special promos and discounts can entitle you to a lot of savings when you go shopping for cheap running shoes. A lot of comparison shopping sites offer various promotions. Some offer discounts outright, while some offer promotional codes you can use to avail of limited or exclusive discounts. You can find discounts reaching all the way to 30%, and you can even get have shipping costs waived. This you can find in most top running shoes stores around. There is yet another option that can allow you to enjoy cheap running shoes. This option may not be feasible for most people, but if you do come across a running shoe that you feel really comfortable in, you can also buy the specific shoe or series in bulk. Buying in bulk will entitle you to a lot of discounts so you can get the shoes for less. Asics Running Shoes - Arguably the best running shoe brand in the world ; together with Nike. 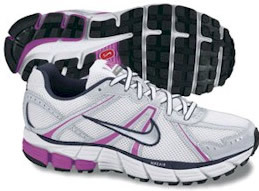 Discount Nike Running Shoes - for tips on discounted Nike Running Shoes / cheap Nike shoes. Best Running Shoes - For more information on what the best running shoes are.